If you are new to gardening, here are five vegetables that are easy to grow in pots or containers at home in your balcony. Take this small step towards growing your own food. To plant a garden today is to believe in tomorrow. There are daily reports of pesticides and chemicals seeping into the vegetables we consume. This strengthened my conviction to take baby steps to grow vegetables. My mother loved gardening. She spent hours and hours tending to the plants. It came to such a point that my brother, all of three years, insisted on having only okra for lunch and dinner every day. We moved cities and countries after three years in that small town, and never got to live in a individual house with a front and back yard. Years later, I found the same passion for plants in my father-in-law. He grew everything from spinach and mint to radish and broccoli. We rarely bought vegetables in the winter, and primarily used the produce from the garden. That’s where my weakness for greens comes from. The limited 8*4 feet balcony space is no deterrent. Last summer, the pots mainly contained flowering plants. This summer, I’m re-potting them with jasmines, and white and orange hibiscus. I’m also adding some vegetables to the mix. It all depends on choosing the right vegetables – the ones whose roots don’t grow very deep. Get started with me if you want to grow your own vegetable garden. I often get questions from beginners on how to get started with gardening. Like, what are the materials required, where to buy them, how to plant, germinate seeds etc. The advantage these days is one doesn’t have to step out of home to start a garden. I have compiled a list of required things you can buy online. The only missing item is potting soil that you will have to buy a nursery close to you. You’ll need containers, cocopeat, seeds, and tools. Containers: The choice of containers is up to you based on how much space you have. For germinating seeds, you can use either of these methods: cotton wool for faster germination or an empty egg shell filled with potting soil. I use a combination of grow bags and plastic pots. I grow vegetables in grow bags. The Cocogarden grow bags are what I have been using for the past two years. They are exposed to direct sunlight. They have withstood extreme weather conditions.The bags come with few drainage holes and are light enough to be moved around, unlike pots. You can use clay or cement pots too. The only disadvantage is they can get heavy, so I prefer grow bags. The recommended pot size is 12 inches. Cocopeat: The medium for planting is soil + cocopeat + vermicompost or manure. The advantage of using a cocopeat brick is it is compact and can be easily stored. To use, break the brick, take the required amount and immerse it in a bucket of water. It will grow in size. Mix this mixture with red soil and vermicompost to get the potting mix. Addition of cocopeat makes the red soil less dense for roots to breathe. Tools: Sooner or later, you will have to invest in a set of garden tools to weed, mix the soil, prune the plants. Always wear gloves before you put your hands in soil. Take two or three ripe green peppers. Slit them open and dry them in sun until. Check out how to germinate seeds. It takes about a week for the seeds to sprout. I can see about ten plants now. After you see about 10 leaves, transplant them into a bigger pot/grow bag – one plant per bag or pot. Seeds: Tomatoes come in many varieties from heirloom to exotic. The size varies, too. If you are getting started and don’t have seeds, cut a tomato you like into four pieces. Then, bury it about 1/2 inch into the soil. Wait for 3-4 weeks for the seeds to start sprouting into a plant. Thin the seedlings keeping one seedling per pot. The plant grows taller and needs support to hold it together. 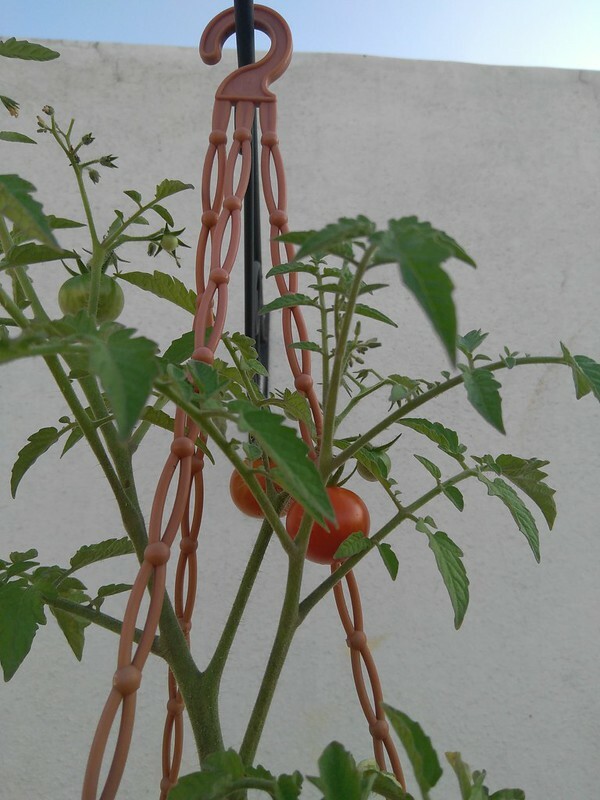 The picture below is that of a cherry tomato growing in a small 10″ wide hanging pot. This is the second harvest. I feed it with organic compost once a week. This without doubt is my favorite herb to grow. Less maintenance and quite easy to grow. But many beginners find it hard. The trick is to use soil that is not too dense. Seeds: the seeds come from the kitchen. How to plant coriander or cilantro: recycle used cans or tins and fill it up with soil. If you can’t make a drain hole at the bottom of the can, fill it up with gravels for about 2 inches and then put the soil on top. Once you have the container ready, take a handful of coriander seeds and rub them with your footwear. Pour the crushed seeds into the can, cover it a layer of soil, water it and forget it. Ensure it gets enough sunlight. When to Harvest: You should have a bunch of coriander leaves within a month. Mint needs a small container like coriander/cilantro. Alternatively, you can grow the herbs together in a big container. Mint grows like a weed. 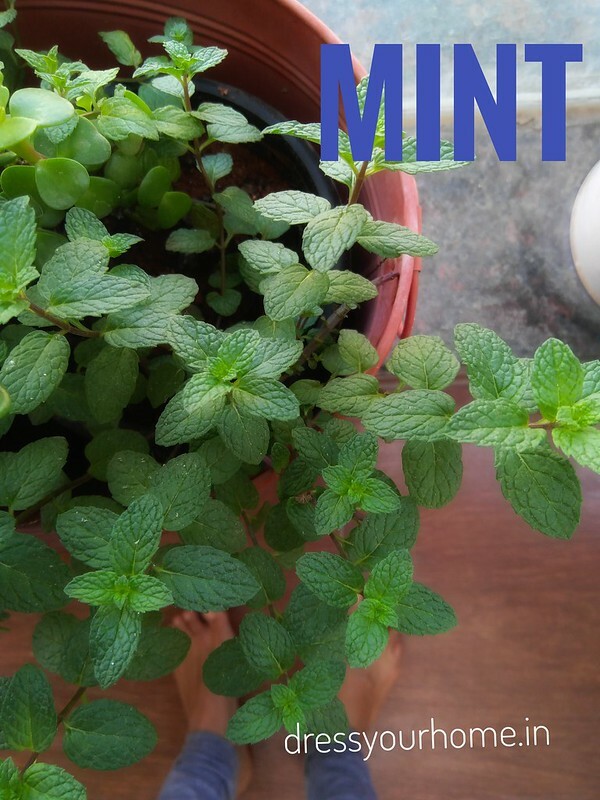 How to plant mint: To get started, buy stalks of mint form the market. Remove the lower leaves. Place the stalk in a pot in a sunny spot and see it grow like a weed. Seeds: buy the seeds. Sow the seeds directly in pots a few inches apart. How many to grow: The plant grows into a vine so train them on the grill or a tall pole. You will need at least seven pots to grow seven plants to feed a family of three. If you grow just one plant, the harvest will not be enough. Nitrate manure is available in most nurseries. Feed each pot with 25-30 gms of organic manure once in 30 days. Sowing, sprouting and transplanting is easy. Protecting them from pests is hard work. The ones that you’ll often encounter are white squishy things along the stems and backside of leaves. This is how I get rid of them naturally, without spraying organic chemicals. Plant feed: plants need nutrition on a regular basis to grow. The best thing to feed them would be dried cow dung. I use a handful of compost/panchagavya every week. I hope you found this useful. I would love to hear any questions you may have. hi, many thanks for this post. i always wanted grow some veggies in my balcony. it is north west facing and gets sunlight from 1.30 to 4 p.m. do you think i can start growing the veggies there? Sharbori: Absolutely. That’s ample sunlight for vegetables. This is the right time of the year to get started. Little sooner would have been better but never too late as the plants will be deprived of sunlight once the monsoon sets in next month. I am also planning to plant vegetables. How do I plant mint. And how do you prevent these from being damaged by pests. No pesticide as we need to use them for eating later…..
for chilli and coriander, does it need too much sunlight? one of my balconies get less sunlight that too in early mornings only… is that enough, or should i shift to another balcony, where it is too much of sunlight in the afternoons? thanks.. will try it out..
similarly any easily growing flowering plant for balcony in bangalore with less maintanence? You might want to try lillies now. These are seasonal and are available in any nursery now. You can get a rectangular pot and plant different colored lillies. These just need watering and do not require any specific maintenance. You can also consider Hibiscus but this will require sunlight and constant observation for pests. As Natti said, you could try hibiscus. Go in for the shorter (hybrid) bush variety of hibiscus. It comes in a range of colors: orange, pink, white, and red. You can get a sapling for anywhere between Rs.20-Rs.60 from a nursery. You could also try Jasmine, nandyavattai (don’t know the English name), bright red flowers that come in a bunch (again not sure of English name), and Arali (in pink and white). One more flower is the Marigold. They take care of themselves as long as you water them. They will dry and the plant will die after sometime but lo and behold you will see a sapling coming out within a week or so. Thanks for the info. I have been trying to find the name of that flower for a long time. I have three different colors (white red and pink) at home but did not know the variety. This is a good alternative to vrikshi(typically seen in Indian gardens and needs to be grounded), which I think is the one below. Will start off with chilli, tomato and coriander first. Do i need seeds of green chillies? Thanks for this post. has been indeed good reading. Can u help me start off gardening in a balcony that faces north east and gets mild sunlight in the morn. I will be moving into the flat by aug end. will it be a good time to start planting? Yes, you can buy seeds to grow chilli. Or, alternatively, you can buy a sapling and repot it in a bigger pot. Chillies need a lot of sunlight, so this may not be the best time of the year to start. For Bangalore climate, February-March is a good time to start or wait a few more months for the monsoons to get over. However, if you are in an independent house or an apartment that receives a lot of sunlight, then you can try it even now. Good that you have a north-east facing balcony. East and north-east locations are as good as it gets when it comes to balcony gardening. You have an unlimited choice of veggies, herbs and annual flowering plants to choose from. Since this would be the first time, I suggest start off slow and you’ll encouraged to grow it. 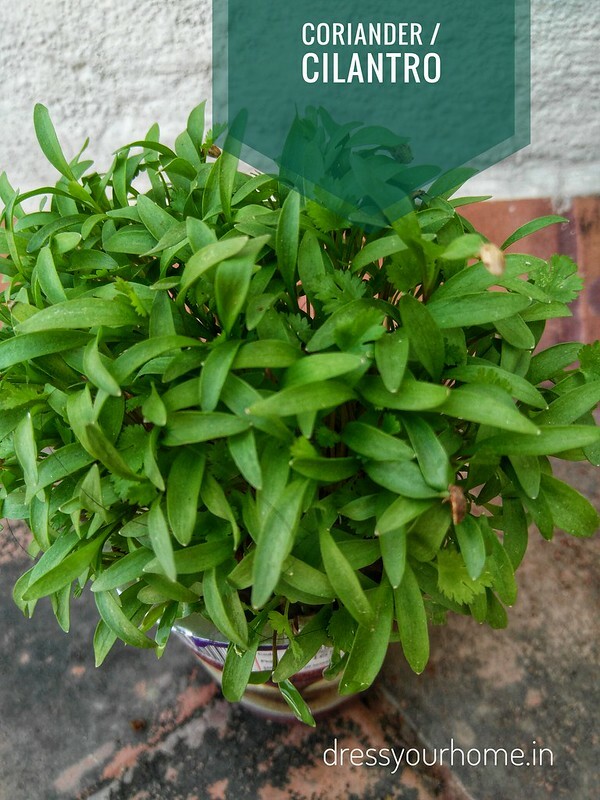 You can plant herbs together in a large single pot – coriander, basil and pudina. Aloe vera will thrive well too in a smaller pot in this location. For flowering plants, if you plant in august, they will start blossoming well by winter in December – hibiscus, star cluster and jasmine for instance. If you are fond of Frangipani, you could have that too. I don’t recommend Frangipani much because it is a hard-to-miss part of every apartment’s landscaping in Bangalore, and there is no individuality. Then, there are the money plants and different varieties of cacti. Gerberas, Glaxinias, petunias are some other colorful varieties you can go in for during the flowering season. Hope this helps. what do you think of putting these in terrace open to sun (just after rain stops?) do u think they will survive even though we are still in late monsoon? Sunlight, in moderate amount, is good for plants during the monsoon. My balcony gets less sunlight (only in morning). What vergetables plants would best grow in light sunlight ? Can I use seeds available in kitchen? What vegetables can be grown in less sunlight and if seeded in Dec? Alo, can I get those seeds from kitchen ? Anil: Which city are you based in? Depends on how harsh/mild the winter sun is. If you are in Bangalore, you can sow chilli/tomato even now. Yes, you can get these seeds from your fridge :) And many vegetables like brinjal grow round the year. Do you want to grow in pots or in the ground? Plants like tomato and chili grow healthier and faster when they receive a good amount of direct sunlight for at least an hour or two during the day. With less sunlight, you would be better off growing herbs. Nithya: you are blessed to receive good sunlight. Lack of sunlight is the bane of most modern apartments. Start with something easy like a money (ivy) plant or hibiscus. This season, if you want colorful ones, go in for the petunias or glaxonias, these are shrubs with bright red/violet/pink colored flowers. Every nursery stocks them. Even marigolds are common around this time of the year. However, these flowering plants are highly sensitive – need good sunlight and just the right amount of water – over watering will kill them. so, take care and let us all know how your garden blooms. I am in gurgaon. Planning to grow them in pots. Earlier I tried growing mint and coriander which had some roots but didn’t work out. Mint was green for few days but later died. Hi Laksh. 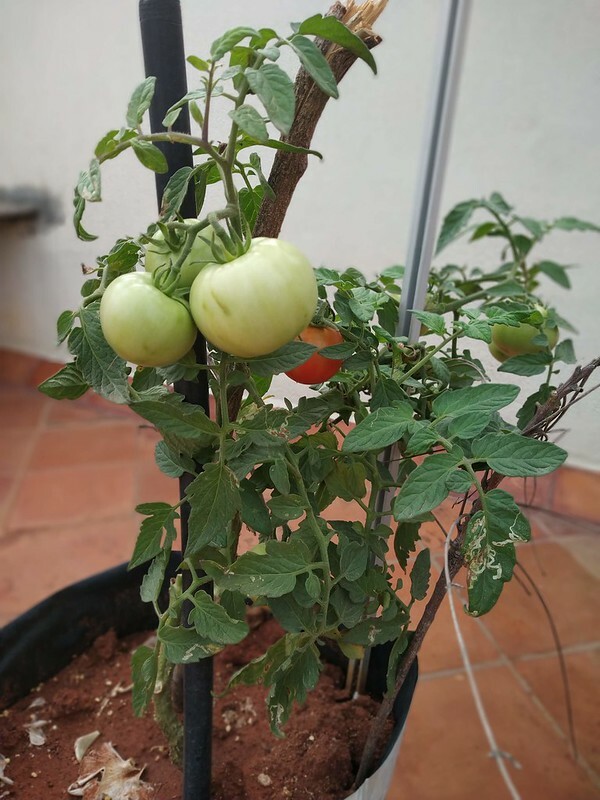 I have grown chillies and coriander in pots and now want to grow some vegetables like tomato, beans, brinjal… I am living in Bangalore and want to know when should I start? I have sporadically grown herbs in pots in my balcony but now want to move on to vegetables. Esp greens/capsicums etc. 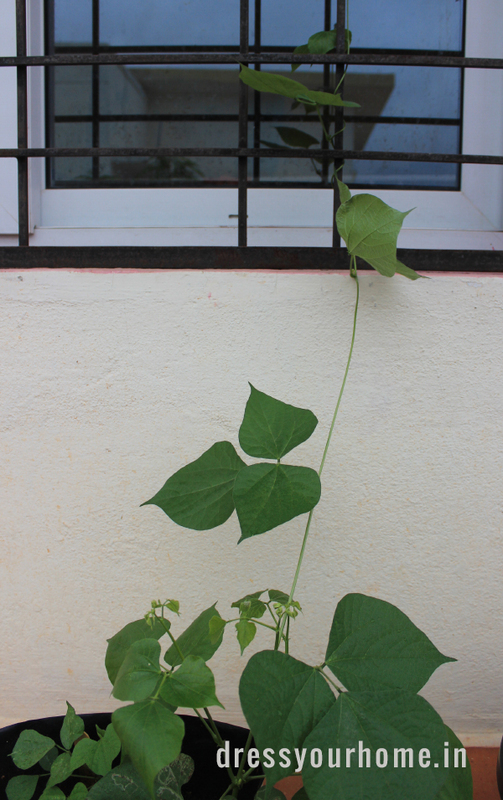 When can I plant them ( I stay in Bangalore)? Also how do i go about planting spinach & methi? Hi, I would like to grow herbs like basil,thyme ,parsley and rosemary in my balcony .Can u pls guide me how to do so and where can i get the seeds/saplings needed.Thx!! one thing which always confuses me is the soil. Do i just pick up the soil from the ground below and pot some seeds in it? or do i have to put some mix in it before seeding. i do not trust most of the nurseries. Liked your method of picking up the fruit and plant it. I will start with Tomatoes. Will this be a good time? Use a mixture of potting soil and cocopeat which you get in most nurseries. The Jeevan Bhima nagar nursery is the cheapest for this. For tomato you can put the seeds in the pot directly on the surface. For others get a seeding tray and transplant them into pots once they are 6-8 inches tall. Tomatoes thrive well in summer. You can try now but doubt you will have a good harvest without enough sunlight. Water them sparingly. Sorry Laksh for disappearing. Thanks for ur info. We now have a variety of plants in our balcony. We have some flowering plants near our bedroom window. Hibiscus which was doing very well has suddenly got a problem. Many of the buds turn yellow and fall off. Would u know what the problem could be? earlier the sunlight used to be from 10.30 to1.30pm but now it is from 8.30 to 11.30am. could this be a prob? I live in Kochi. I stay in a flat which has a balcony facing the south-west. I have no idea about growing plants, but wish too. Please Laksh, help me. Thank you. 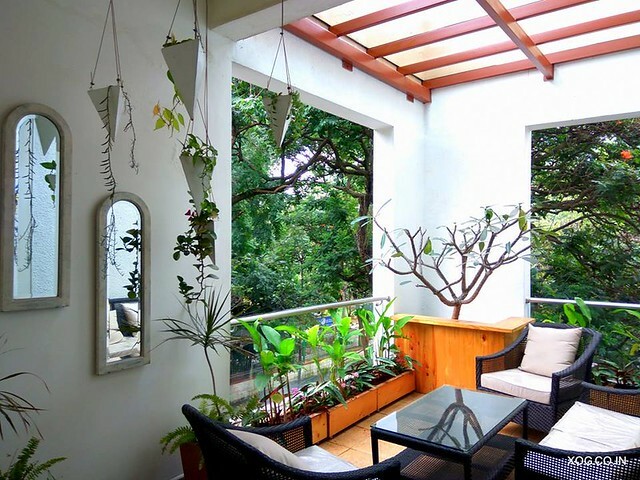 Hi Samyukta: The location of your balcony is such that it won’t receive much sunlight during the day but ample during evenings and in winter. If you want a herb garden, start in a small container (not necessarily a pot) and some easy maintenance plants like ferns, hibiscus, ivy etc. You could later move onto vegetables. I will be retiring in 2 Yrs time & i am going to start a kitchen garden in my balcony. All your inputs will definitely help me. I have started vegetable gardening in last month and vegetables plants on the balcony (north facing) is pesting me with one or the other issues. 1) While the okra plant is having 3 okras and growing, the leaves that was affected by aphids have yellow and whiting spots indicating a chlorophyll deficiency. Is it due to the neem oil treatment or the deficiency of sunlight? What is the right size of the okra for harvesting? 2) The bottom leaves of the tomato plants are yellowing. Is this an issue with over watering? I water them every day, but alternate mornings and then evenings. (If I water today morning, then I water them tomorrow evening) I am based in Bangalore. 3)The spinach that I have planted on Aug 3rd has all grown, but leaves are of about 3 inches in size and even with good sunlight they look some what drowsy .Is this normal ? 4) I ahve some corainder leaves about 2 months old, strated flowering, with out much of leafy growth. 5) After transplanting them I have applied a handful of vermicompost to all the plants to avoid the nutritional deficeincy. How often do I need to add the compost?I bought panchagavya after my friends advice and used it on the plants on last sunday (first time). hi laksh,ive got a terrace with no sunlight can u suggest some plants or veggies that can be grown there? i live in pune. Sorry for the delayed reply. You mean balcony with no sunlight? What direction does it face? It must be getting some amount of sunshine atleast for some part of the day. Ferns and ornamental indoor plants will thrive well. Betel leaf among herbs requires less sunshine. Most vegetables require good amount of sunlight at least for a few hours during the day. Hi Laksh, I am staying in tirupati. i wanted to start planting few vegetables in balcony.I have no sunlight problems. Can u suggest to me as to what veges i should start with? Tomato is good to start with you. You can target to pick a ripened tomato in 100 days if you start now. Just about anything will work now with good sunlight – chillies, beans, ladies finger, brinjal etc. Happy gardening:) Let me know once you harvest. Take care to feed organic manure and check for pests often. I have planted some green chillies and the plants were growing fine. These days I see the leaves turning slight yellowish compared to green one. Do I need to use some kind of pesticide ? Can you please help. Chaitali: As far as I know, if the leaves are turning yellow, it is most likely due to overwatering or underwatering. Observe if the bottom leaves are turning yellow or the fresh ones. Some plants like tomato and chilli don’t require too much water. If your pot doesn’t drain excess water, then that may add to the issue. That’s fine. Only if the flowers fall will you get chillis. Regarding growth, is it getting enough sunlight? Check if it is free of pests too. A little pruning may help the plant grow. Add a compost to the soil. Hi, What is the best season to grow tomotoes and chilli in bangalore. Becz I have few tomoto and chilli plants which are a month old. Can I plant it now? i am from bangalore. This site is inspiring me. What are the best veggies to grow now. I have few tomoto and chilli plants, which are a month old. Is it right time to grow them. No sunlight problem. I have full day sunlight. Hi Samhi: Flowering plants usually do well this time of the year. 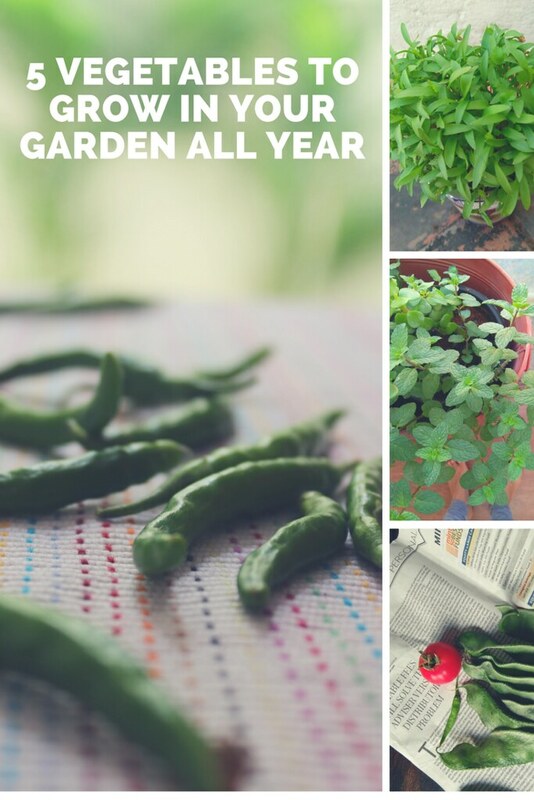 Most veggies require a good amount of sunlight and tomatoes/chillies are best sown in balcony gardens in Bangalore around Nov./December so that they you can take the yield around February/March. Be wary of pests this time of the year. hi,i have seen many complaining about flower drop in chilli, it is common feature if watering is done heavily,more nitrogen application may be another reason,so pot planting of chilli to be done carefully and maintain as far as possible dry atmosphere . Just came across your blog. Recently moved to bangalore and beside enjoying the glorious weather of the city, found new love for kitchen gardens (albeit in a small space in my balcony). Shilpi: Thanks for stopping by and welcome to Bangalore. 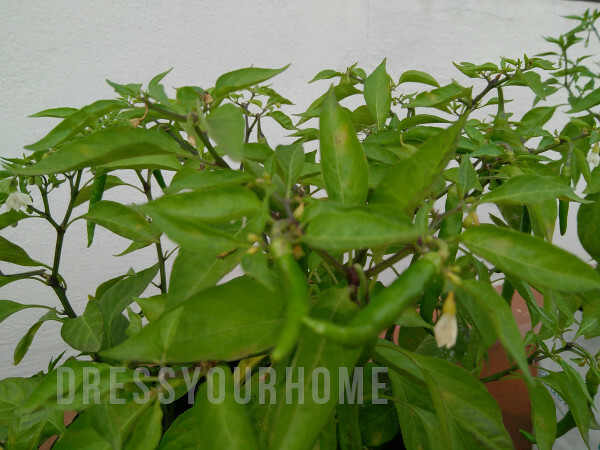 Do let us know how your plants do …my chillis have begun flowering again. Sudeshna: You can plant the coriander seeds in a small pot from now on and need not be transplanted. I’d suggest a few cms high or when you notice real leaves before you transfer them to a bigger pot – just ensure one sapling in one pot. I read your article which was very informative and helpful. I have grown tomatoes, beans, coriander, mint in my terrace garden. It feels awesome to see them and use them. THanks for this wonderful article. I wish I could post the pics but donno how to do it in this section. Loved this post. i have been browsing the net for a couple of days as i want to start growing some veggies in my small space in balcony. I am a begginner and have no clue where to start. I live in Noida (U.P.) please suggest how do i start. and if you know of any good nurseries in Noida/Delhi. Thnaks a lot!! Very useful post. Loved it. Is it possible to grow cabbage in home? Please share the tips. This is really wonderful. Very useful post for the beginners like me. Along with these 5 vegetables, i would like to grow cabbage, ladies finger, etc. Please share us how to grow them, the correct season, sand type, required area. I have some place in my compound to grow them. Hi Charanya: You can join the organic terrace gardening group on FB and post your questions. The group is very helpful. Thanks for the nice post. I came through to your webpage searching for suggestions for vegetables that can be grown in pots in a apartment balcony. 1. Regarding the seeding for the chillies. Is it ok to take the seeds from the green chilli that we get from the grocery store and use them for planting? 2. Do chillies and tomatoes grow throughout the year? Thanks in advances for the answers. I have 1000 ft^2 for gardening space.but I dont know the soil preparation techniques n need to know easier ways to increase the productivity of my yard.i have struggled a lot as a lot of stones are in my soil.pls tell me how to test my soil n earn great veggies n flowers. Hi Geetha: Yes, very much in Bangalore. Would have loved to show you the balcony garden but there's not much left of it now. I have given away all the pots and will be starting afresh soon. Hi I have a big balcony in Ahmedabad. Very fond of growing vegetables. Tried many things. Only chillies succeeded. Mint only small leaves coming. Coriander leaves are small. Can you specifically help me stepwise? Brinjals became yellow on the plant itself. Can't make out what's wrong. Either season is wrong or spacing between seeds or depth of the soil? I am Kuleena from calicut.people laugh at me when I tell them that I am growing vegetables on my balcony.it is a great inspiration to see that I am not alone in this venture. Hi, I am home maker from Noida, visited your website while searching for vegetables names that I can plant in April to reap in next few months. Please share some ideas for summer kitchen garden. It’s a good list to start a small garden on the balcony. Thanks for the idea and the advices. I just moved to a new place and was thinking to place some containers on the balcony, to make it more friendly .Greets ! I m a keen beginner. I live in Noida &have a small green patch facing north east. My experience says that people fond of gardening shd not stay in noida . The place has awful water & soil quality. Foliage growth is not as rewarding as found in other places. Its disheartening &depressing. I would welcome useful suggestions for d same . I live in South Delhi. I have tried to grow basil, tomatoes , lady fingers and small brinjals in pots. I have always faced the problem of insects on these plants. I have tried spray of melathion liquid (diluted with water) but this has proved ineffective and most of the time the plants die . Please tell me what to do. Have you tried changing the soil? Sometimes the problem lies with the soil as no matter what you do the pests keep returning. Hi, your post is inspiring. I am very much interested to make a veggies garden on my balcony. I am planning to start with herbs(coriander & mint) and chillies. Could you please tell me where I can find pots and sterilised soil. I had planted a sprouted potato about 15 days back, now the plant has grown and it is bending and fallen to the ground. I tried digging to see if the potatoes have grown. Is it the right thing to do or I have to support it with stick and still time for yield. please advise.. Yes, please provide it support. 15 days is too soonfor potato to grow. Your blog is really informative n useful.I live in Ghaziabad.here soil quality is very low .what can I do for improving soil quality?it’s texture is Sandy. I live in pune and have moved to another flat which has a big balcony but does not get direct sunlight, I had planted chilli and tomatoes prior moving and they were doing great in the previous balcony where they had 6+ hrs if direct sunlight. Please advise what should i plant here. Balcony gets pretty hot during afternoon but the sunlight gets blocked by building. I am very much interested in growing my own vegetables. I have no much place to grow these so I want to get it in pots or container.can you give me ideas for how to grow vegetables in container. I live in Bangalore & rented house. 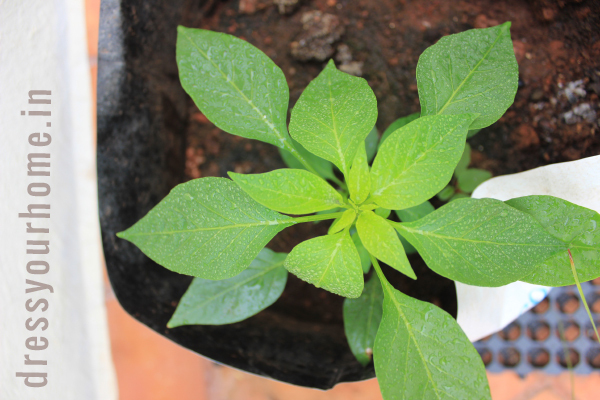 I am interested in growing green chillies, tomato, spinach, coriander leaves, mint,cabbage…. Hi Vijayalaxmi, A small 12 inch pot would also do. Coriander is a little difficult for beginners. you can try growing mint, lemon grass form cuttings. Good soil, a little bit of sunlight and good drainage are important. don’t make the soil too porous by filling only with cocopeat. You can use any container you find in the house form paint buckets to old buckets, curd containers for growing herbs. Methi microgreens are relatively easy to grow and taste yum as parathas. If you can see roots underneath, then yes transplant them into a pot for better growth. A green net should help. 1. My balcony size is 9.5 *5.5 so can I start in this size of balcony? 2.. to grown vegetable we need purchase soil (organic) online or any soil will work.? 3.As I am fresher from which vegi I can start in my initial phase? 4. Which vegetables I can grow in rainy seasons? Thanks Taps for stopping by at dyh. 1. Yes, it’s a good size to start of your balcony gardening. 2. Ideally any soil should work but it requires some bit of cocopeat and manure. Cocopeat to loosen the soil and manure for nutrients. 3/4. Right now I have spinach, methi, basil, ladies finger, lemongrass, lettuce, radish, and cucumber growing in my garden.Cucumber requires sunlight and may not be the ideal thing to grow now.Also plants are susceptible to pests during teh rainy season so you need to take extra care. You could start with microgreens first. Take a small plastic tray. Fill it with cocopeat. Sow some methi/spinach seeds. You can harvest them when they are around 3 inches or so. This will be a big boost to your confidence, and you could start off with other vegetables later on. Sunlight is very important for most vegetables. I stay in first floor and trying to grow vegetables. As it’s a apartment, only few hours of sun would present. Coriander took a month to grow. Please suggest vegetables which would best suit for my conditions. 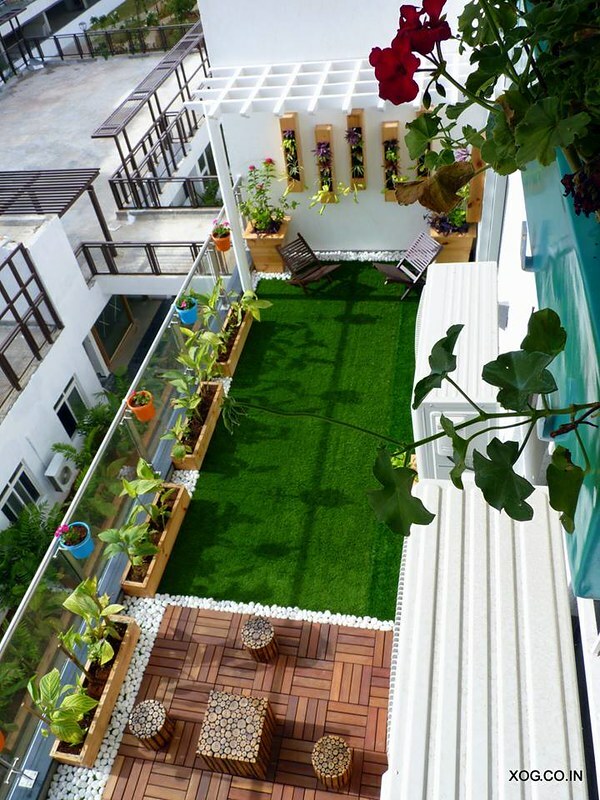 Hi, I’m new to gardening and have a small balcony in noida that has ample of sunlight from noon to evening. I want to plant veggies and fruits like tomato, chilli, papaya, pomegranate, guava,brinjal and other useful ones. Please guide if they should be grown from fresh fruit seeds or plants should be brought right from nursery. What is the right time to grow each if them. Is it advisable to grow fruits in pots in balcony? How long before the fruit will start growing ? Hi Nidhi, thanks for stopping by here. You can definitely start with the vegetables. Seedlings are usually difficult to get for vegetables. You may start with seeds. Chilli, tomato, brinjal are excellent ones to start with. I would suggest grow what you eat. For fruit plants, it is start with a sapling. Depending on the fruit, it may take anywhere from 2-3 years before it begins to bear fruit. Hope this helps. Fruit plants require large containers. Loved your post seems too inspiring, Iam blessed with a backyard, I would want to use the sides and corners to create a floral mix and on the other side veggies , probably I’ll start with chilies and coriander , any other you would want to suggest. Also there are mosquitoes in the back yard, could you recommend plants to repel them. Thanks for stopping by, Nihal. Avoid planting hibiscus when you are just starting. The plant is prone to pests. You can plant herbs such as basil, lemon grass, betel leaf, brahmi, and green such as methi, curry leaf and lettuce – all of these are really easy to grow. If you have enough space you can opt for fruit trees too and lemons too. Vegetables such as beetroot, tomatoes, cucumbers, chillies and brinjal are easy to grow. Thanks for your post. I followed your post and put tomato seeds and today I saw first small tomato. Please suggest some vegetables that I can grow in my balcony in Bangalore climate as it is bit cool place. That’s awesome, Ashutosh. If you get ample sunlight, you can try chillies, cucumbers, carrots, radish, brinjal and okra. I have all these growing in mine now. i would like to start home gardening in Mumbai flat. i have small balcony of 2ft by 10 ft height. would like to grow corainder, green chilli mint leaves tomato etc. will that be possible. Also guide from where to buy natural fertiliser to do the same. There are many sites where you buy organic manure. Or if you have space to keep a bucket in a balcony, you can compost at home too with just the vegetable peels. Given the lack of space in your case, you can grow these in containers positioned vertically. I want to start to grow some veggies in December month .I want to know about soil and seeds . You mean now in January, right? A mix of soil + cocopeat + vermicompost in equal proportions is good to start with. Cocopeat to loosen the soil and vermicompost for nutrition. Seeds you can use either from your kitchen for tomatoes, methid and coriander, or you can get from a nursery or online for other vegetables. I just started following your post. I’m new to gardening and have a small balcony in my Kolkata flat that has ample of sunlight from morning to noon. I want to plant veggies and flowers. Please suggest which plants to be grown in this time as summer is coming. Also, can I prepare the compost by mixing used tea-leaves with vegetable peels together or seperately, please advise. Only ornamental plants. All veggies require sunlight. Great Payel. This is the best time to sow radish, chilli, spinach, beet, carrots, beans, and tomatoes. Your posts are simple, informative and easy to understand and implement.How to plant curry leaves? which is the best way? seeds/sapling/grating? Thank you for your kind words, Sharon. It is best to get a sapling from a nursery. Curry leaves are hardy in that they are not easily affected by pests but they do go through periods of no growth.It is important to either feed them with some organic manure or butter milk at intervals. And then, you see a sudden growth spurt. Also, plant them in a space that receives good amount of sunlight. You will love the fragrance of the home grown leaves free of pesticides. hi, i plan to a big balcony and planning to keep big vessels 2 to 3 ft deep and 2 to 3.5 wide. Which fruit plants apart from lemon i can grow? How much sunlight is requied for papaya as in summmers i get 2/3 hours of sunlight but in winters i hardly get sunlight. Can u suggest where i can get kum quat seeds? All fruit trees require at least 4 to5 hours of direct sunlight in a day. The size of the container is not a problem but sunlight is. It would be best to grow kumquat from a sapling instead of seeds. Visit the horticultural department of your city or a nursery that has such saplings. All the energy of the plant is going towards foliage and new leaves. As you mentioned it is a big pot, the focus is now on growing and not producing flowers. What you can do is pinch the branches near the top of the plant. This will ensure it branches out and starts producing flowers. I hope the plant is receiving enough sunlight. Keep the pinching process in small amounts until you start seeing flowers. What do we do to get vegetables throughout the year? How often should we plant new seedlings? The number of plants per vegetable you need to grow depends on your family size. You will have to choose the crop accordingly and based again on what your family prefers to eat. For instance, radish, spinach, cauliflower and broccoli grow well in winters. You can sow them after the rains sometime in October for harvesting from December through February. Greens can be grown throughout the year. They are susceptible to pests in monsoon though. To get water melon, cucumber in summer plant it early February. Hope that answers The trick is in choosing what grows well during the time of the year and having enough quantities. If you have only 1 ladies finger plant, it will give you may be 3-4 ladies finger every 3-4 days. I have a small balcony in a flat and would like to grow seasonal vegetables and some greens. Could u please advise the best way to start with in Sept itself. Along with the things required . Can u do it myeawlf or do I need gardener. Dkaur: thank you for stopping by at dress your home. Yes, you can start the garden very much by yourself. Let me outline the steps for you. The best vegetables to start sowing towards the end of this month once rains settle down would be radish, spinach, beetroots, beans, and cauliflower. Additionally, you can also sow tomatoes and chilies. 1. Buy seeds for all of them except tomatoes instead of using from your kitchen. It works best as the seeds come treated for fungal infection and the germination rate is high. If you don’t want to invest in a seedling tray, take a small rectangular tray and fill it with potting soil. Potting soil is not your regular soil but one mixed with manure and cocopeat. 2. Make a depression in the soil with your finger in an inch gap. Sow two seeds in each hole. 3. Water them lightly. They will germinate in a week or two depending on the seeds. When the seedlings are about 9-10 inches tall, transplant them into individual bigger pots. 4. Radish and beets you can sow them directly. Their stems are weak to be transplanted and they are root vegetables. Fertilize them after flowering with compost. It’s as simple as that. You will get a hang of it once you start. There will be a few failures, in the beginning, don’t be disheartened. The joys of holding the first harvest are unparalleled. I Have 3- to 4 ft well grown Chilli plants (2 nos.) in one pot of 4ft*1 ft*1ft. Plants are giving flowers but next day they become yellow anf fall no fruits yet since last 5 months. Pls advise. Hi Rahul, is the plan getting full sunlight atleast for a couple of hours? plants in cement & mud pots are growing well but those in plastic containers are not growing at all. what may be the reason. Hi Ravi, is the potting mix the same? And how about the size of the pots, the amount of sunlight they receive and what plant is growing? If everything is the same and it’s only the plastic pots, then we can safely assume it’s the container. hi!!! 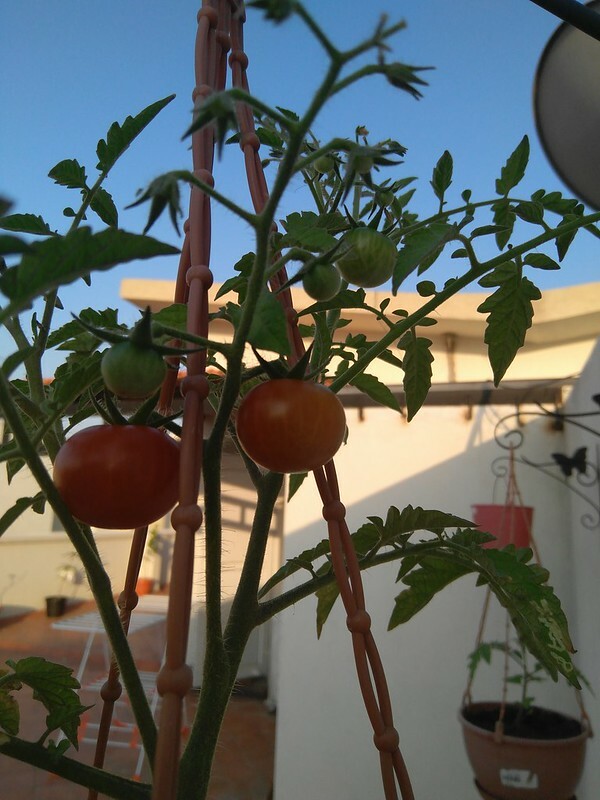 i would like to know what is life span of tomato plant? and i need vine/climber/creepers veg plant i already planted, bitter gourd, watermelon, grapes! i would like to know good vines to grow in Bangalore, Karnataka India! can you help let me know? and i am planting in a pot! thank you!! Tomato plants live for a few months at most. You can prolong their life with care by pruning the tips, removing the dead ones to promote new leaves. But they grow to a certain height and start producing fruits. It also depends on the type of tomatoes you are growing, heirloom, hybrid or cherry varieties. Cherry tomatoes last one season even in a small container such as a hanging plant. You can see mine in one of the posts. All melons (especially musk melon) and Pumpkins grow well in Bangalore. I have grown water melon and orange pumpkin in the past. For vines, different varieties of beans grow well. You can jut create a support with thin branches or bamboo sticks. the tricky bit with pumpkin or melon when planted in a pot is they don’t grow large enough. Keep the soil loose and let them spread on the ground. Oh and just ensure there is enough direct sunlight. All these vegetables require at least a few hours of direct sunlight. Most often the plants are infected by white pests sticking to leaves and stems which organic/ natural pesticides should I use? Hi Rajashree, you can spray those insets off first with a hose of water. This will work if the plants are in terrace. If they are in balcony, I understand you wouldn’t want to mess the place. then get pure neem oil that is water soluble, and meant for garden. These days you get neem oil in supermarkets too, don’t use that. The important part in this is to be consistent in spraying after every 2-3 days until they are gone. Also remove those insects by hand and put them away. The information that you are providing is gr8. very helpful for beginners. I was searching online and very lucky to find your side. I am From Hyderabad and started gardening on my terrace. I planted few seedlings in the month of December -18 such as tomato, brinjal, broccoli, okra and radish. its been almost one month and i don’t see and kind of growth. My mixure consists of just vermi compost and garden soil. I planted spinach, coriander and methi in large growing bags and they are doing very fine. But problem is with samplings. Could you please let me know where i am going wrong and what kind of precautions should I take. I water them everyday morning. Also please suggest what samplings should i put in month of February in Hyderabad. Thanks. Hi Srikanth, I’m glad you found it useful. The reason you saw success with greens is because mild winter is when they grow well. With the others, especially tomatoes, this season has been harsh. Keep the seedlings in full sun. Okra and tomatoes should grow well before the summer hits. Radish will grow only if the soil is loose. It should be ready to harvest within a month and half. I just harvested a batch today. This is the perfect season to grow radish (actually we are 2-3 weeks late). Have you checked the underneath of tomato and okra for pests? Do you see brown or yellow spots on the leaves? Brinjal, especially will look find from the top but on the bottom is infested with white bugs. The plants you have chosen are fine. You can try bitter gourd and any of the gourds too now. Cucumber also does well before full summer hits.